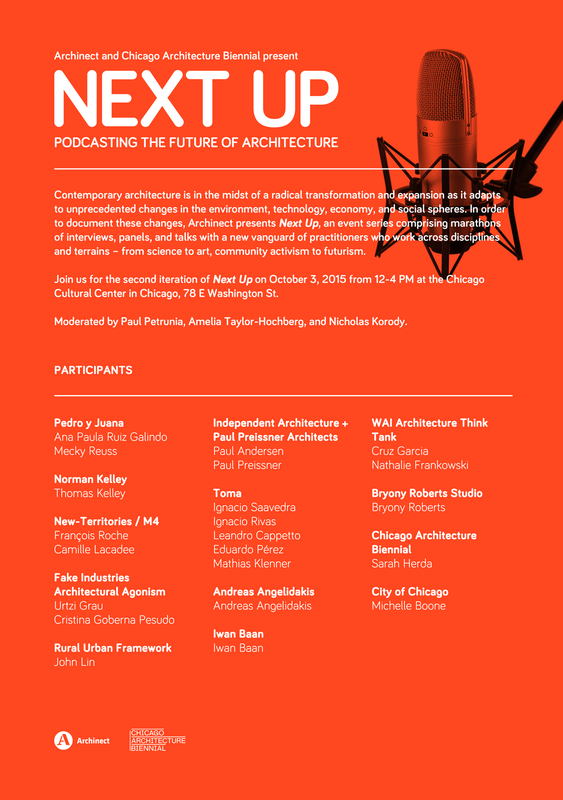 Archinect is excited to announce the Chicago installment of our two-part live-podcasting series, Next Up, hosted in collaboration with the Chicago Architecture Biennial! Next Up will take place on Saturday, October 3, from 12 - 4pm, at the Chicago Cultural Center's Randolph Sq. The event is free and open to the public – come watch the discussion unfold, and add your own questions to the mix via #NextUpCAB. For more details, and updates to the line-up, check out the Next Up Facebook event. And make sure to follow us for live-updates from the Chicago Architecture Biennial's opening weekend! On (finally!) Instagram @Archinect and Twitter @Archinect, #NextUpCAB. If you miss out on the live-action, you can still catch the interviews – we'll publish the whole event as an episode in an upcoming season of Archinect Sessions. "The State of the Art of Architecture" delivered by the Chicago Architecture Biennale Exhibition must leave lay-visitors bewildered by one overwhelming subliminal message: contemporary architecture ceased to exist, the discipline’s guilt and bad conscience has sapped its vitality, driven it to self-annihilation and architects have now en masse dedicated themselves to doing good via basic social work. A less charitable interpretation sees the hijacking of the newly created Chicago Architecture Biennale by a marginal but academically entrenched ideological tendency within the discipline that has abandoned their societal remit of innovating the built environment at the world technological frontier and instead pours its allocated resources into concept-art style documentation and agitation of behalf of underdeveloped regions and milieux. I am rather suspicious of these creative/artistic engagements with poverty. It sometimes risks to mutate into a questionable aesthetization of poverty, a questionable romance. Questionable because what the poor of this world most probably (and rightly) aspire to requires little creativity and imagination because it is already plotted out for them by the ladder of development leading up to what has been achieved in the most advanced arenas of world civilization, where – in contrast - true, path-breaking creativity is indeed called for. Even if my scepticism is too pessimistic and genuine concern and developmental help is forthcoming from the protagonists exhibited at the Chicago Architecture Biennale, one still wonders whether these laudable concerns should usurp the space that was presumably meant to be allocated to contemporary architecture. For example, why should an ARCHITECTURAL Biennale give a huge space to an ART project like Amanda Williams "Color(ed) Theory" when the ART has already its own (many more) venues for public display/discourse. How is this more relevant to contemporary architecture than contemporary architecture itself?? When architects are too narrowly focused inward on "architectural" concerns and don't engage broader issues related the politics, labor, justice, race, gender, sexuality etc, the resulting design work can seem inaccessibly nerdy and borderline irrelevant. Artists tend to create work that engages directly with more aspects of contemporary life. Perhaps this is partly why art culture evolves so rapidly as society changes while architecture culture seems to lag far behind. Say 'hi' to John Lin for me, Paul. Long story . . .
really appreciate his recent buildings. you must stay home a lot then, knoa.